The KM 183 omnidirectional is based on the tremendously successful KM 184 cardioid microphone, which has become a standard within the global studio community in just a very short time. 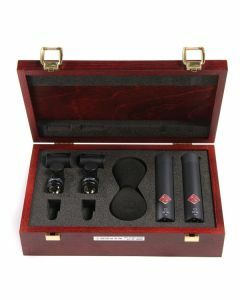 All "Series 180" microphones are available with either matte black or nickel finish. The KM 183 microphone is the successor of the well proven KM 83, which has been used since the seventies worldwide with great success. The KM 183 is a pressure transducer with a boost of approximately 7 dB at 10 kHz in the free field. In the diffuse sound field it has a flat frequency response. In typical usage, there is no coloration of sound over a wide pickup angle. The "Series 180" microphones have the same transformerless circuitry as is used in the KM 100 system, resulting in excellent technical specifications.